Everyone knows that keeping a clean room has many benefits. A Georgia man discovered that finding a winning lottery ticket can be one of those benefits. 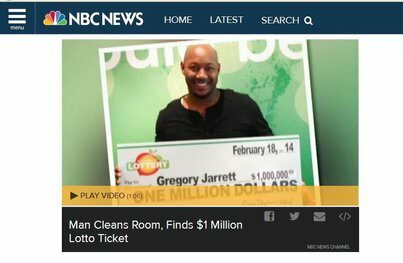 While cleaning his room, Gregory Jarrett of Decatur found a month old lottery ticket that had just been gathering dust up until that time. When he checked the numbers however, he realized that he had a match for five of the numbers drawn in the Jan. 15 draw of the Powerball lottery. As soon as he realized he had won, he asked his mom to come and verify it. They realized that he had won a million dollar jackpot. He collected his winnings last week, and has been keeping a low profile since. He says first priority is settling bills.